Safe and great for any house or building, the solar string lights come in many colors, designs and styles and typically may be installed both inside and outside your house. Most of the solar string lights out there are durable, eco-friendly and not expensive, making a nice impression wherever you’d place them. This doesn’t mean you don’t have to consider some things before getting them and first thing to check is your city’s regulations and bylaws regarding the issue. The minute you find out it’s ok to have them in your yard, you can take a peek at some of the nicest models out there, not before writing down (or simply scrolling down) some useful tips. Not all solar string lights have the same power and if you’re not using batteries, it’s better to install a large pane on your house so that nothing stays in the way of your solar string lights. It’s quite obvious that you may use solar string lights in right climate, with plenty of sun so that the solar panels get their energy from the sunlight. This doesn’t mean you can’t use them in a colder area, even though you may want to try solar lights with a higher level of illumination, with brighter-colors light. You should also play it on the safe side and get lights that also include removable batteries. Where you’re hanging the solar string lights is also important and a clear, cluster-free area works great for them. You also need to keep an eye on the safety issue. You may easily wrap them around a fence, near a power outlet or on a balcony/porch. Keep an eye on any broken light bulb, as you don’t anyone injured. Fortunately, for all of us, many of the solar string lights out there come with rechargeable batteries so you don’t miss out on a big night. If you live in a colder climate, you may have to change the batteries on regular basics. 1). When you want to go for a nice impression in your yard without paying too much money, give it a go with the AMIR Solar Powered String Lights, 100 LED Copper Wire Lights. The solar string lights include 100 LED lights on 33ft. high quality copper wire and look cute and nice in any setup. The s360 degree-viewing angle is steady and illuminate in all directions. The string lights work nice in any patio/gate/yard/ party and so on. The copper wire is pretty flexible and long lasting and it’s coiled with bobbin winder to minimize mess. The string lights aren’t just easy to display, but also easy to take away for storage. They are eco-friendly and present a high-energy conversion rate. The solar string lights are easy to use and the switch buttons (power on/off) is responsive. The light has two operating modes (Steady on/Flashing) and the auto on at dusk/auto off by day. 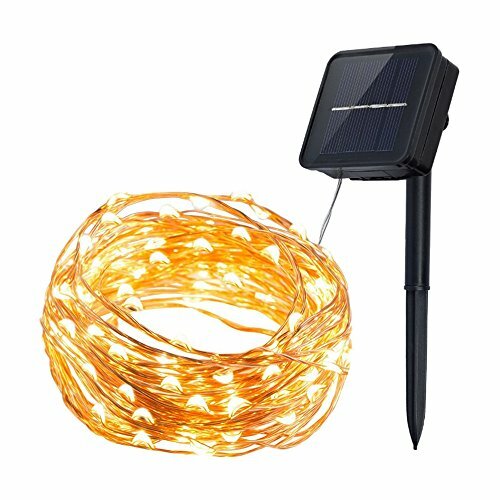 It’s also important to mention that the string lights and the solar panel are water resistant, presenting an IP65 waterproof degree. The flexible copper wire is very flexible giving you the chance to get creative when displaying the lights. The warm white of the light is nice and the string lights look cute in any scenery. Despite the minor issues, for the cute looks and flexibility of the copper wire, the solar string lights may be the last detail that your balcony needed. 2). Bendable and waterproof, the Ankway Bendable Copper Wire High Efficiency 200 LED Durable Fairy Outdoor String Lights bring plenty of good things to the table, apart from the nice light and appearance. The string lights are solar powered and you don’t need any battery or electricity as they charge by the sunlight. When fully charged, the string lights work up for even 10 hours. They automatically turn on when it gets dark and turn off during the day. They are highly versatile and you may choose one of the 8 setting modes, from steady color to various flashing. We also have to talk about the good build of the string lights that are easy to bend and waterproof. The copper wire isn’t just flexible, but also quite long (72ft.) and takes up a good beat. It’s easy to notice the wire from a distance and we like it as it really stays in place. As for the waterproofness, the string lights have an IP65 waterproof grade, but don’t push it by submersing them in water. As for the use, it’s very simple: you simply place the solar panel where it gets the best sunlight, enjoying the string lights in the evening. If you need the lights to also work during daytime, you have to fully cover the panel. Lightweight, you may very easy wrap it around a cardboard when not in use. 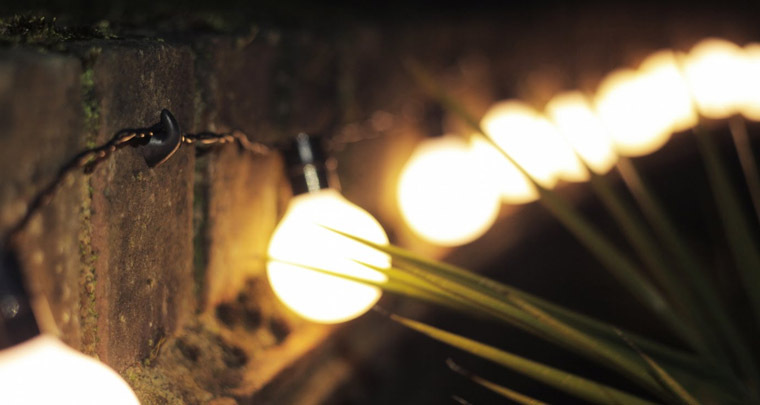 Versatile and dependable in many situations, the string lights give a warm white light. 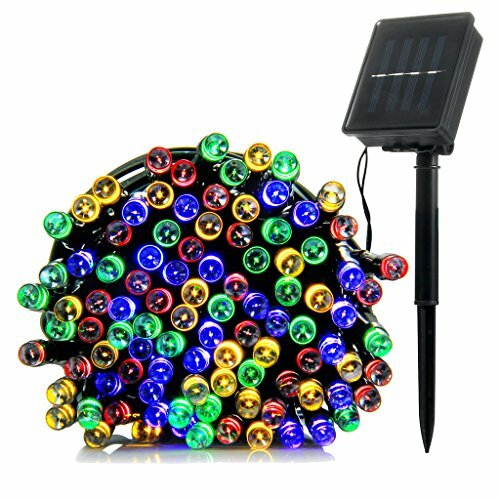 Focusing on the bright side, we like the versatility and reliability of the solar string lights, especially when checking the price tag. 3). 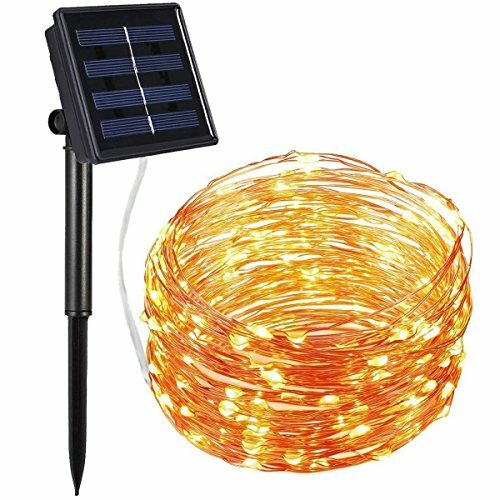 Even though they work the best during the winter seasons, you may also use the InnooLight Solar Starry String Lights 33 Feet Copper Warm White 100 Led Outdoor Lights whenever you want to warm up the feel in your garden/patio/balcony. The string lights feature 100 dimmable fairy lights and the copper wire is long enough (33ft.) to let you play with it for better impression. The 360 degree viewing angle is steady and the string lights are nice altogether. The copper wire is quite easy to bend for the perfect display of the lights and takes the regular use. You may easily design the string lights into any shape you want and the wire is quite subtle. Solar powered, the string lights are money saver, as also include a built-in rechargeable Ni-MH battery. The solar panel has an adjustable design so it gets the best exposure to the sunlight. Both the solar panel and the string lights are waterproof. They present no welded points and are easy to install. All in all, the string lights look nice and improve the appearance of any area, even if you don’t pay that much. 4). 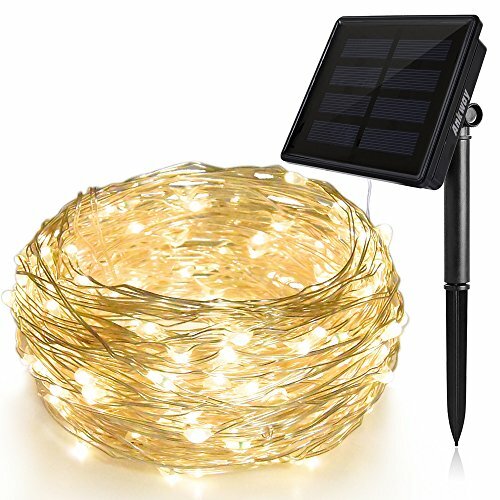 Used indoor and outdoor as well, the ILLUNITE Solar String Lights Outdoor Indoor are a good option, taking the difficult weather conditions very well. The string lights are waterproof and are strong enough to handle snow and rain. The wire has a good length and a nice color (somewhere between a yellow, warm white) and the lights have a nice size as well. They are definitely the brightest option out there, but they are tiny, adding a nice feel to any area. It’s quite easy to install the string lights and the two part plastic garden stake that come along are easy to snap and attach to the back of the solar panel. You may want to place the solar panel in a place where it gets the best exposure to sunlight. The tilt of the solar panel is adjustable so you may expose it in the best position to get the sunlight. The string lights come with automatic built-in sensor that turns on/off automatically the lights, according to the time of day/night. You may use one of the 8 light modes, according to each situation. The string lights are compact and don’t tangle that easy. Lightweight, they work in any area and take the intense use rather well. For the versatility, nice light and the good build, the solar string lights are a wise buy anytime. 5). 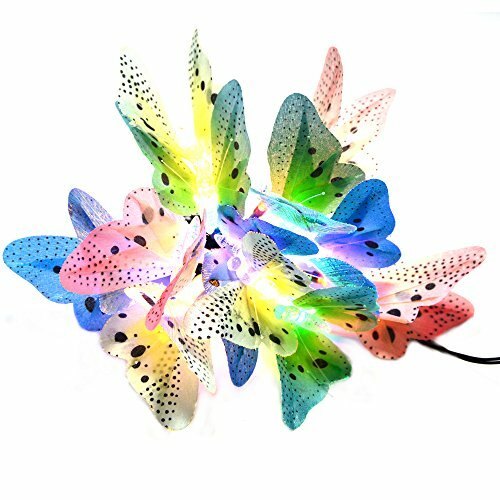 If you’re not necessarily into the “heavy-duty” solar string lights, but rather go for the pretty options that impress most with their appearance and light, don’t hesitate and give it a go with the INST Solar Fiber Optic Butterfly String Lights. The string lights may not be or offer the strongest light out there, but they sure change a lot any area, lighting it up with its nice, pretty colored butterflies. You may bring some color and life to your garden with each of the 12 solar-powered fiber optic butterflies. You may place them carefully, for a better view. The string lights come with a solar powered panel and a built-in rechargeable battery. For more versatility, you can also replace it with a Ni-MH battery. As for the light, you may set the right lighting mode by choosing one of the two light modes: flash or steady on. The wire is around 11ft. and is good quality, taking up a good beat. Don’t forget to turn on the string lights so that you really enjoy it. Even though you may feel like paying the extra buck for them, the string lights look nice and go great in any area, no matter the occasion.